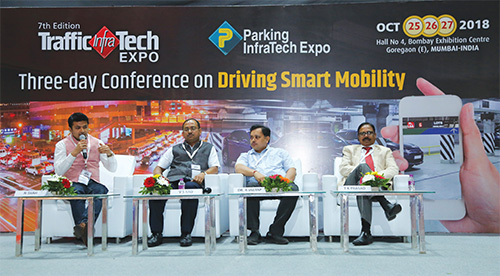 T Krishna Prasad, Director General of Police and Chairman – Road Safety Authority, Government of Telangana, kicked off the session with his thoughts on the importance of mobility in Smart Cities by first defining what a Smart City is. According to him, there is no single definition, but to put it simply, if the citizens are happy, comfortable and convenienced, and their quality of life is good, theirs is a Smart City. Technology is just an enabler; if the technology is great but the citizen is not comfortable, that city is not Smart. The proof of the pudding is in the quality of life. 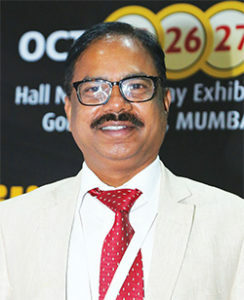 He said that a Smart City needs to provide services to all cross-sections of society, with particular attention paid to senior citizens, women and children. These services must improve the citizen’s quality of life, and also be affordable for the State. This crucial balance between usefulness and affordability can be achieved by designing efficient public utilities that draw on sustainable resources to ensure their durability and longevity. Focusing on urban mobility and land use, he opined that they go hand in hand, and can make or mar the quality of life. He urged town planners to take a macro-level look at the overall land use plan; does it promote comfort or complication? Coming to urban mobility and public transport, he gave the example of ageing public buses and their flaws: senior citizens and children found it difficult to climb 4-5 steps every time they entered or exited, there was no proper seating, no air-conditioning and too much jostling when it was time to alight. Not long ago, 30% of all trips were made in buses; that number is now down to a measly 20%. He compared this to the new Bus Rapid Transport System (BRTS) buses, which are comfortable, air-conditioned and with low floors. These buses are designed to operate over short distances, and hence have less sitting and more standing room, reducing overcrowding. A comfortable commute ensures that the commuter is not fatigued even before he reaches his workplace; productivity increases. If a citizen has to shift from a cab to a metro to a bus to get to his workplace and repeat the sequence on the way back home, he shouldn’t have to stand in queue to buy a ticket every time the mode of transport changes; ticketing should be seamless. Reducing travel time by appropriate road engineering, and addressing the pollution caused by vehicles will go a long way in encouraging the shift to public transport, as well as improving public health. Between public and private vehicles, which group occupies more road space and which provides better services? The irony is that private vehicles, which account for only 25% of all trips, occupy almost 70% of available space. On the other hand, half of all trips are made on non-motorised vehicles or on foot, but there are no dedicated cycle lanes or well-maintained footpaths, forcing cyclists and pedestrians to find dangerous ways of navigation. Tellingly, 50% of those who die in road accidents are pedestrians or on two-wheelers. More and more vehicles will be bought but it isn’t necessary that each vehicle should be taken out every day. We need to change the mentality to make people understand that if their vehicles are left at home, the whole city will be happier.